Got to do another movie poster for the Alamo Drafthouse theater in Littleton, CO. 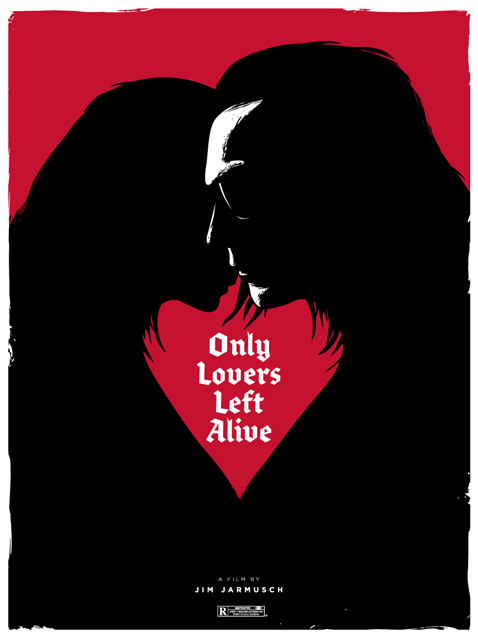 This one is for their upcoming screening of Jim Jarmusch’s vampire movie from 2013, Only Lovers Left Alive. This one took me a while to figure out. It’s not a typical vampire movie, so i wanted to avoid any cliche or over-used images of vampires. 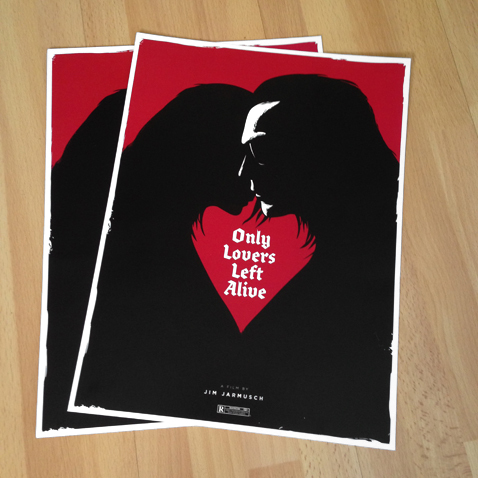 The two main characters are lovers, so i thought if i could somehow make the shape of a heart, that would be perfect. I sketched holding hands and heads touching, but finally figured out that if i made their bodies and heads close to touching in an embrace, the negative space could be the heart! i should also mention again that this was not a studio licensed project, so i couldn’t use studio logos or actual likenesses of actors. got a couple digital prints for my personal collection as well.